I am currently writing from the sunlounger next to our personal plunge pool/jacuzzi. Kathryn is currently at the Spa enjoying a deep cleansing facial treatment and should be there for the next hour or so. Yesterday we both treated ourselves to a revitalizing treatment that included a foot bath, body scrub, all over deep massage, moisterising and a head massage. It was part of a discount offer for new arrivals – within about 2 minutes of getting back K was booking her next treatment. We have a small reef just off the back of our villa and I’ve had a bit of an explore – Kathryn had a fish smile at her upon which she decided that snorkelling wasn’t her thing. Yesterday afternoon I went on a snorkelling trip and we went round a series of reefs on a boat. There is another trip later in the week where you might be able to see rays, (small) sharks and turtles. I’ve put a couple of photos up onto flickr and our photogallery but the islands satellite internet link wasn’t keen on the full half a gig of photos! One last word about the food – the first night here we ate in the underwater Ithaa restaurant, it’s the top restaurant in the resort but it was our one week anniversary! I won’t say any more as I think Kathryn was keen on writing about that experience. Last night however we went to the standard buffet restaurant and I have to say it was great – the choice was massive and varied. We both went for the Indian option and ate a massive meal followed by two different desserts. If she’d had room I think K would have had 8! We also had breakfast this morning and again the choice is excellent even if I did end up going for beans on toast – it’s funny how the heat makes you less hungry. Well, I usually leave the blogs for Dave to write, but have decided its time for me to give a quick update (nothing to do with the fact that Dave is currently out swimming in the reef with all the wonderful fish!, will get to that a little later). I didn’t think we could trump the hotel which we stayed in whilst at Dubai – but very quickly the Conrad Maldives resort at Rangali Island has now taken place as the most luxurious place we have ever stayed. Today we have been finding our feet around the resort. 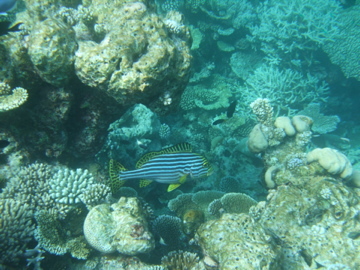 The sea is amazing, crystal clear and with so many fish around the reef. I was quite excited when I saw what I thought was a giant angel fish, unfortunately for me, it wasn’t, and to my surprise (and Dave’s amusement at my completely panicked exit from the sea) it was a reef shark. I don’t care what they say, a reef shark may be harmless, but I don’t trust any fish beginning with ‘S’ and ending with ‘hark’! I decided to opt for the sanctuary of our own, sharkless, private pool, for most of the day. With the fridge fully stocked with Champagne, fine wine and Cokes (for Dave of course), His and Hers Spa treatments booked for tomorrow, I am sure that the remainder of our honeymoon will be as amazing as what we’ve already had. The first bit of our honeymoon is 4 days in Dubai staying at the 5-star Jumeirah Beach. It has to be said that as hotels go it is a class above anything we’ve ever stayed in. Closest we could get would be the Royal Caribbean ship we cruised on but this outdoes even that. And the funny thing is this is “only” 5-star, the view out of our balcony is the picture to the right – the 7-star Burj-Al-Arab (excuse the poor photo, it was done on my phone). Our hotel has 22 restaurants, a fully equipped gym, spa and even it’s very own waterpark – the Wild Wadi. You could easily come on holiday to Dubai and never leave the hotel complex, it has everything you’d want. Small niggle is that we’ve come during Ramadan so that restricts the eating and drinking options but we’re not suffering too badly from that – the breakfast range is enormous, you can have everything you’d normally think of and 3 times that in things you didn’t think of. Sushi for breakfast anyone??? We’ve eaten in the posh Italian one night and then in the outdoor Pizza restaurant so far. Tonight is the Tex-Mex place. We’ve visited the water park twice and today did a guided tour of Dubai. The stories of the place being a building site are true but this doesn’t really spoil anything, rather just make you want to return as they expand. We visited the site of the new Dubailand resort – think Walt Disney in the desert. It’s going to be massive when it’s finished (Tom M had better start saving). We also visited the first of the Palm Islands, its still being built but already a second one twice the size is underway and there is going to be a 3rd which is SEVEN times the size. It is impossible to visualise how big a land reclamation project of this size is without seeing it. 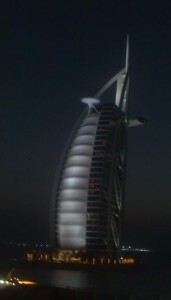 We also saw the Burj Tower – the world’s tallest building by about 150m and it’s still going up!! It must be said there is so much money and investment in Dubai it is easy to see where they get the reputation from. We’re leaving late tomorrow night for the Maldives so we’ll catch up then. Taking over from Palace’s play off final victory in 2004 as my best ever day, yesterday I married Kathryn Louise Hopkins. It truly was the most fantastic day in so many ways. Eighteen months of planning and preparation came down to one single day and almost everything went according to plan. Following one of the wettest summers I can remember I awoke in my B&B to look out across the Usk Valley knowing that in a few hours the sun would have burnt away all the mist and we were set for the best Saturday weather in months. Carl and I (and Jodie) enjoyed breakfast and got ready well in time and when we arrived at 12.30 were the second car to arrive. Over the next hour our many guests arrived including many I hadn’t previously met including Kathryn’s friend Vee from work. Ten minutes before the start time Carl and I sat down at the front and waited. And waited. And waited. Then Carl got asked to go out. Then Carl took dad out with him. At this point I was starting to geta little concerned. Shortly afterwards though everyone sat back down and I later discovered it was just a bit of drama due to to locating the rings. Then Paul the organist started up with Jesu, Joy of Man’s Desiring and we were all set to go. I must admit I did expect a heads up of when Kathryn would be coming down but didn’t get it and as I turned to look she was almost alongside me. At that moment my head swirled as I stood there with my jaw dropped. Kathryn looked fantastic and simply took my breath away. We said our vows and I can guarantee we both meant every word of them but it was all such a blur, one second we were at the front, the next signing the registry and I can barely remember walking back out. Trumpet Tune was playing and I can’t remember it at all. Mark, our photographer then took numerous photos before whisking us away for a few photos on our own and in no time we were back at Llangoed Hall and meeting our guests as man and wife. At no point in all this do I think I stopped beaming. Every time I looked at Kathryn I felt I had to pinch myself. Several hundred more photos later we were taken to one side while the guests were seated for the Reception Breakfast. We had a short time to chat and chill out before we were introduced. In almost no time the food was over and it has to be said it was stunning. I think everyone thoroughly enjoyed it and even though everyone was already full the trio of chocolate desserts all went down well. During the meal I realised I’d left my speech in the car boot but although Carl offered to go fetch it for me I was never really happy with it anyway so took it as a sign and decided to just come up with it off the top of my head. Kathryn’s dad was a bag of nerves by this point but he thrived on the pressure and his speech was excellent – no-one who was there will be able to read the words ‘Nil by Mouth’ in quite the same light again. Dad’s speech was good, and mine went down well enough – it was shame the twins were asleep by this point so couldn’t have their bears. Carl went fairly easy on me although he did come up with a video from when we were kids but Barrie came off worse than me so I’ll take that! Soon it was onto the evening entertainment and this started with fireworks which were great – and only slightly spoiled by the grand finale celebrating the wedding of G and J. To be honest it was a minor point and I think it gave everyone a bit of a giggle. The entertainment was an Elton John tribute and while there were some initial reservations I think everyone enjoyed it – personally I thought it was great fun. Then Sammy played some music to follow which was most appreciated and worked really well. The evening wrapped up around midnight and we settled down by opening a few cards. In the morning everyone was down at breakfast when we arrived and it was great to hear everyone saying how great the previous day had been. We started to watch our guests depart and when our parents left we took a quiet walk around the gardens while we got our emotions in check before finally saying goodbye to Lynn and Bryan. Since I’ve been home I’ve been humming Jesu Joy – I think because, for me, it signified the true start to the happiest day of my life. It was a perfect day and I’ll post shortly with a list of thanks. Just a quick entry to follow up on the Nike organised Human Race we entered. Although it wasn’t announced when we entered Nike contacted everyone doing it’s Human Race 10K just before the event to say there was a free tshirt in it for all participants. Kathryn is particularly keen on the race Tshirt so this was an added bonus just before we had to do it. It was also extra incentive for me while I was whinging about my sore ankle. I’ll be honest though I expected a) the tshirt to be a bit cheap, not rubbish cheap as Nike have a reputation to uphold, but not great; and b) to probably have to pay a fiver postage or something. Post race 2 weeks or so went on and I thought the free tshirt dream was over until they sent an email allowing each finisher to claim a tshirt and for proper free – no postage or anything. I was quite pleased. Even more pleased today when they both arrived today and they are very very good. Each has your own unique race number on it and it’s a very good drifit type tshirt. It even matches K’s running kit so she’ll be especially pleased. Big thumbs up from me for Nike – the entire event must have cost a few bob and was for some great causes. I guess it’s because the death toll hasn’t been that high and the press reckon we’ve got enough news of our own but I never realised how big an impact Hurricane Ike had had. Check out some of the pictures here. There are 15 days to go until Kathryn and I get married and we’re really looking forward to it even if we have a seemingly never ending number of things still to do. However, this is all of course depend on whether the new Hadron Collider in will destroy us all on Wednesday. Fingers crossed it doesn’t as I’m not sure our wedding insurance covers “cancellation by apocalypse”. 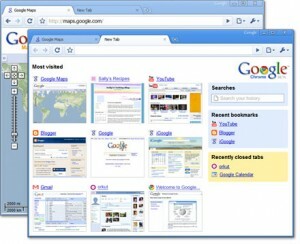 In a move that suprised me quite a bit Google have announced their own web browser. Pitches directly in competion with IE and Firefox but apparently designed from scratch to suit today’s modern web user – or some such waffle – it works a bit differently. Google have even come out with a comic to tell the story. It’s 30 something pages and does get a bit detailed but certainly the first 10 pages show you where they’re going. It’s also open source, and I get the feeling they’re looking for someone like Firefox to pick up their ball and run with it – Firefox Chrome with a silver fox instead of the usual red one perhaps? It certainly looks interesting from the screenshots. The beta is apparently available tomorrow but I’m hoping that they release an OSX version not just a Windows variety. They’ve not ignored Apple completely because googleblog makes reference to the fact they borrowed opensource code from “Apple’s WebKit and Mozilla’s Firefox, among others”. Two quick updates to my last two posts. We did the Human Race along with many thousands of others and despite what I said about an injury I managed a new PB – 49 minutes 25 seconds is almost another 2 minutes off my previous best. I guess the rest I’d had did me good. Waiting to find out about how we claim our Tshirts! Also – as predicted Palace sold one player, released another and signed no-one. Good luck to Tom Soares and Dougie Freedman though. Tom deserves a crack at the higher level and Dougie deserves more games that we could give him. And Robinho to Man City! What was that all about!? It comes around twice a year but always has the ability to cause a stir. It can make people dare to dream and hope but more often than not ultimately ends in disappointment. At the tail end of every August and January internet using football supporters sit glued in front of the BBC home page and various message boards frantically hitting F5 (or apple-r for the more discerning among us) with the hope that our team will sign *the* player who make the rest of the season a success. Many stories will come and go, players spotted at the airport, my friends dad’s taxi driver overheard it, and we’ll sit and devour everyone in the hope that some of them are actually true. Of course for every team buying there is one selling so the smaller clubs inevitably lose as many players as they sign. Will your Championship star striker be flogged off to bolster some lower half Premiership club’s substitutes bench? Will your 17 year old wonderkid head for Spurs’ reserves? Will your overweight and overpaid reserve team stalwart get picked up by some mug with more money than sense? It’s 7 o’clock and there’s still 5 hours to go – I live in hope that something magical will happen but it probably won’t. And knowing Palace if they do sign anyone the fax will get jammed and it’ll all fall down anyway.